As Irish people, we’ve made our presence very positively felt in the US, the UK and even Canada and Australia. The thing is, when it comes to Asia, how many of us can say “My uncle is working in Shanghai” or “My cousin set up her own business in Tokyo”? Very few of us, would be my guess. Every summer I facilitate workshops at #SavvyTeenAcademy, which I co-founded with Monica Murphy of MONERE Development. Our Savvy Teens share many of their international dreams with us. They say they want to be in the thriving heart of Silicon Valley, have a corner glass office in New York or travel the East coast of Australia. Again, few of them share goals of succeeding in Hong Kong or navigating the Chinese landscape. In my opinion, that’s because we Irish don’t know Asia, we don’t get Asia and we haven’t been hungry to discover Asia. In Ireland, we have been richly rewarded for doing business with the US and the UK. Culturally, we “get” them. If I take the example of our own business, Hayes Culleton Ltd, we started working with a new client in recent months in the US – from the point of view of culture, it was a seamless experience. We Irish are even closer to the UK: not only do we speak the same language, we also share a land border, and the Irish have a keen interest in British sports teams, politics and TV soaps. In both cases, there already is a huge population of Irish there on the ground. However, we don’t know the Asian personality yet. And so doing business in Asia seems too complex. That’s all going to change. A week doesn’t go by without yet another statistic showing that Asia Pacific is set to be the fastest growing economic region of the next generation. In May, the IMF dclared that “Asia is expected to grow by around 5½ percent this year, accounting for nearly two-thirds of global growth, and the region remains the world’s most dynamic by a considerable margin”. 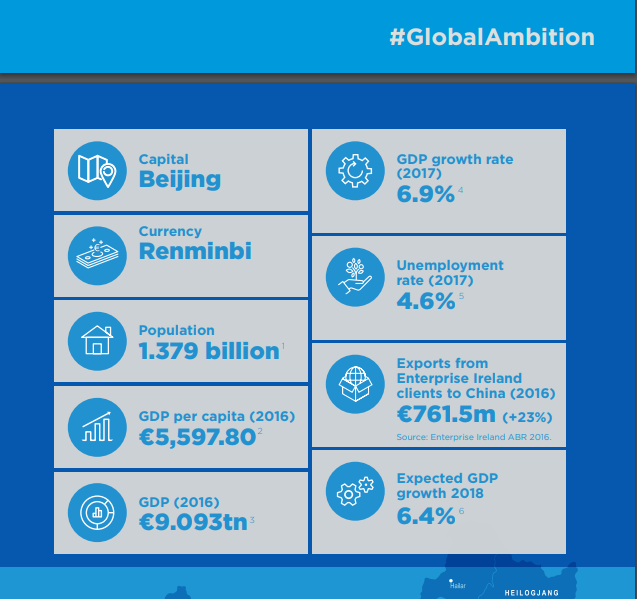 Enterprise Ireland are dedicating considerable effort into making export-focused businesses and homegrown hospitality outlets “China Ready”. Universities are looking East to build new partnerships. Third level students want to travel to Vietnam and India during their summer. The Department of Foreign Affairs is keen to expand their influence right across the continent: in their “Ireland Global Footprint to 2025” plan they commit to developing “a new cross-sectoral, whole-of-government Asia-Pacific Strategy, recognising the strengthening relationship between Ireland and many Asia-Pacific countries”. More conferences and events centre around the theme, including the recent “Routes to Asia” showcase in the Aviva, which drove home the point: “The region is home to more than half the world’s population and will account for more than 60% of the global middle class in the coming years.” Cathay Pacific introduced a direct flight from Dublin to Hong Kong in June. We can also look at developments at a European level. The EU is currenly working on concluding an Economic Partnership Agreement with Japan. It’s the biggest bilateral agreement ever negotiated by the EU. It removes the vast majority of custom duties that cost EU companies €1 billion per per year and opens up the Japanese market of 127 million consumers to Europe. The trade and investment agreements with Singapore are the EU’s first completed bilateral deals with a member of the ASEAN. Enterprise Europe Network has a presence in Vietnam, Indonesia, Qatar, Russia, South Korea and many other countries. Finally, there are more and more companies setting up in the region, notably in the FinTech sector: Fexco, First Derivatives and other companies. These companies are thinking strategically about how to attract people to work in these environments: they are aware that it will be important for graduates, families and commuting business people to have a route to connect with others for business, employment and career opportunities, as well as catching up with people from home. It’s exciting! It really is. However, while operations are being put in place and implemented, they’re very recent or futuristic. So when will we get to reap the benefits? And where do we start? Yet, an Irish organisation has been there all along: the GAA. The first Asian Gaelic Games took place in Manilla in 1996. This November 2018, over 1000 players are set to descend upon Bangkok to meet, network and play the games. There are 160+ players who form part of the Asian Youth Championship. The Asian County Board‘s reach extends across 12 countries in the region and it has ambitious plans to think further and faster. Its architecture is strong, inclusive and thriving. In my view, the GAA is the landing pad for the Irish – those looking for business, employment and career opportunities in Asia would be well served to look to the GAA community as a solid starting point. Watch my video: Asian GAA is right in the centre of four mega-trends. I spent a week-end in Shanghai in the spring, as a keen observer of the All-China Games. People travelled from Hong Kong, Beijing and Korea to the Irish “locals” in Shanghai. I spent many hours talking to people, and they all had memorable stories to tell: starting their careers in Asia, travelling across the region with the GAA, finding career opportunities in unexpected places, going on an adventure to Korea for the World Cup in 2002… and still being there over ten years later. I was intrigued by the breadth and depth of knowledge that I found; from where to begin a job search in a new city, to the familiarity with local cultures, to the professional connectivity people can find while training on a Tuesday night, and the incredible goodwill to help a fellow footballer. The thing is that Asia is also challenging. The languages are different and remarkably difficult to learn. The culture of doing business is very different. You need to invest time in cultivating Guanxi and building relationships. The flights are long haul and the time differences are very significant. You may need to start all over again with new social media platforms. Currency fluctuations are sometimes volatile. That said, who is best placed to introduce you to this new world? The answer is: those who you already have a strong connection to. The one place that you’re guaranteed to find a “gang of Irish” is in a GAA club. People who have lived in Asia for decades can be a crucial source of information and guided direction. The newcomers to the region who are looking for a new social outlet may also be looking for employment. If you’re looking for a key contact in a large Asian company, through the dramatically reduced degrees of separation of the Irish community already there, you may find that your path to success is shortened (and sweetened!). So what can you do to prepare your business or your career to look eastwards? Who can help you when it comes to successfully doing business in Asia? And the list goes on – there are many more. At HayesCulleton Group, we were of course excited to explore business opportunities in Asia. But where do you start? It’s such a huge continent… As I’ve done before, I decided to go the route of the trade mission – it has worked tremendously well for our company before, and so when Dublin Chamber offered a trade mission to Hong Kong, I jumped at the chance. Trade missions are an amazing way to discover a potential business destination in a very efficient, focused manner. Trade missions are also generously subsidised in my experience, and admirably organised. You don’t have to think about the logistics, everything has been set up for you, and you only need to concentrate on pure business as you are chauffeured around, from networking events to incredibly valuable briefings. In just a few days, you discover the lay of the land thanks to a plethora of bodies, associations and organisations, both local and Irish. They are eager to help you, as your success is their success. Related: Video: when is the right time to start exporting? Not quite ready for a trade mission yet? Without leaving the comfort of your own country, you can attend a “Doing business in Asia” event. There is a range of them, depending on which country or which city you have your sights on: China, Japan, Thailand, Singapore, Shanghai, Hong Kong… The list goes on. These briefings are a highly focused and efficient way to take the first step and learn useful information, while networking in a strategic way. Have a look at events organised by Enterprise Ireland and Dublin Chamber. At one remove, and while you wait for the next “Doing business in Asia” event, sign up for updates from a recruitment company with offices in Asia. Morgan McKinley for example has a newsletter with a high information content. A few years ago, I did several webinars about the economy in the Asia Pacific region with them. Recruitment companies need to give accurate and detailed insights about the job market to both companies and potential recruits, and so they are wonderful allies if you want to find a reliable source of information about the latest developments. Morgan McKinley are present in China, Japan, Singapore and Hong Kong. The Asian County Board has poured Herculean energy into bringing the organisation to where it stands today and there is so much more to come. As Asia explodes with opportunity, I believe that business, diplomatic, professional and cultural organisations looking East have a lot to learn and a lot to gain from wearing the jersey of this oriental county. The post The Irish doing business in Asia: where to start for a successful Asian strategy appeared first on “The Positive Economist” Financial – Economics – Fintech & Entrepreneurship Articles.